Overview - Academy Award® Winners Christopher Walken and Philip Seymour Hoffman* strike all the right chords with Academy Award® Nominee Catherine Keener** and Mark Ivanir in this powerful story that blends raw emotion with fiery passion to form an unforgettable cinematic masterpiece. After 25 years together, the members of a world-renowned string quartet learn that their beloved cellist (Walken) may soon be forced to retire. But the news stirs up equally painful challenges when competing egos, harbored resentment, and irrepressible lust threaten to derail the group as they struggleto maintain harmony in their music — and their lives. True harmony is a rare and almost transcendent occurrence. Relying on a pitch-perfect synchronization between otherwise disparate parts, if one tiny component is suddenly nudged out of balance, the whole affair can come crashing down, replacing a once stirring melody with painful dissonance. In Yaron Zilberman's 'A Late Quartet,' four musicians are forced to learn this lesson the hard way. A well performed and occasionally absorbing drama, the film overcomes some sporadic pacing and scripting concerns to reach an ultimately moving climax. Peter (Christopher Walken), Robert (Philip Seymour Hoffman), Juliette (Catherine Keener), and Daniel (Mark Ivanir) are all members of a successful string quartet. Just as the group is preparing to rehearse for the upcoming concert season, Peter receives some troubling news about his health, and is forced to consider retiring. With their future now uncertain, the once harmonious foursome slowly fall victim to interpersonal turmoil, jeopardizing their friendships and careers. Forced to face long-buried insecurities and frustrations, the quartet will have to overcome their issues, or risk parting ways once and for all. Following a leisurely rhythm marked by periodic crescendos of drama, the film's structure aims to parallel the tempo of the chamber music its characters play. Dialogue driven scenes focus on the ensemble as they struggle to come to terms with their slowly dissolving union, leading to several escalating internal and external conflicts. Issues dealing with bruised egos, misplaced pride, stilted passion, regretful infidelities, and ill-conceived romances are all weaved throughout the runtime, creating a slowly billowing symphony of restrained chaos that eventually reaches its boiling point. Music of course plays a large role in the proceedings as well, and several scenes featuring the characters playing beautifully arranged classical compositions are layered into the story. Throughout it all, the movie's quartet of lead performers do a solid job of carrying the picture, and the actors come together to form a convincing family of sorts -- making their crumbling dynamics all the more painful to watch. The always reliable Philip Seymour Hoffman is very effective as Robert, the insecure second violinist who increasingly resents his supporting role in the group. Serving as his counterpoint, Mark Ivanir is also convincing in the part of Daniel, the stoic, cold, and obsessive de-facto leader of the ensemble. Seemingly devoid of true passion, he's the least likeable character, but the actor does a nice job of gradually revealing the man's deeper, hidden layers. Catherine Keener's take on Juliette is equally proficient, and the actress balances her various conflicted loyalties well. As commendable as the entire ensemble is, special note must really go to Christopher Walken. The actor is now mostly known for playing gangsters and kooky eccentrics, but here he gets to tackle a rather poignant role, and Walken really steps up to the plate. Tender and quietly affecting, his performance as Peter is the film's real highlight. Tragically faced with a potentially debilitating illness, the character has to come to grips with his physical limitations, and watching him struggle to keep up with his peers is utterly heartbreaking. Demonstrating a level of gentle sensitivity rarely glimpsed in his other recent work (though his turn in the fantastic 'Seven Psychopaths' is also strong), Walken reminds viewers that he can play far more than just creepy and bizarre characters. He's the true heart of the picture, and it simply would not work without him. While there is a lot to admire about the film, unfortunately the narrative and direction aren't always in tune. The movie's tone can sometimes veer toward being overly stuffy or histrionic, with sudden bursts of drama that seemingly come out of nowhere. On a similar note, some of the characters choices seem muddled and lack the necessary on-screen build-up and development to make them believable. These faults are especially true of a pivotal scene between Juliette and her daughter, Alexandra (Imogen Poots), and a later sequence between Alexandra and Daniel. The film's pacing is also a bit problematic, with the tempo often becoming stagnant. To this end, scene after scene of the characters talking about trying to solve the quartet's various issues start to pile on one other with little forward momentum or progression. In the included special features, the director discusses how he closely modeled the script's structure after Beethoven's Op. 131, and while that's an interesting intellectual idea, I'm not so sure it actually translates well to the screen. Admittedly, my appreciation for this deliberate arrangement might have been greater if I were more familiar with the intricacies of musical composition and performance. As it stands, however, I must confess that I'm not very musically inclined (I can't even whistle). Regardless, these stumbles are all relatively minor, and the movie's finale is undeniably powerful, mostly justifying the sometimes uneven road that gets us there. 'A Late Quartet' doesn't quite find the perfect harmony that it strives for, but it comes pretty close. Though there are some issues with pacing and tone, the characters and their dilemmas are interesting, creating an insightful parallel between the balance of music and the balance of life. Bolstered by a truly affecting performance from Christopher Walken, the film ultimately works its way toward a poignant and stirring conclusion, capping off a bittersweet cinematic melody that's certainly worth a look. 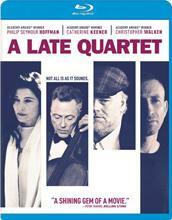 20th Century Fox brings 'A Late Quartet' to Blu-ray on a BD-25 disc housed in a keepcase. After some skippable trailers, the screen transitions to a standard menu. The packaging indicates that the release is region A coded. The movie is provided with a 1080p/AVC MPEG-4 transfer in the 2.35:1 aspect ratio (incorrectly labeled on the package as 1.78:1). Shot digitally on the Arri Alexa camera, the film features surprisingly impressive clarity and depth, resulting in a rather beautiful picture. Though there is some negligible grain-like noise in a few shots, the source is exceptionally clean and free from any pesky artifacting. Fine details are rendered strongly, and the image maintains a pleasing sense of dimension. The color palette veers toward warm hues, but certain scenes also evoke cooler shades when appropriate, and saturation remains rich and natural throughout. Whites are bright without blooming, and black levels are steady and deep with great shadow delineation. Though the cinematography itself is nothing to get too excited about, the image is sharp, pristine, and vivid. From a purely technical perspective, this is near reference quality. The film is presented with an English DTS-HD MA 5.1 track along with optional English SDH and Spanish subtitles. Since this is a story about musicians, the runtime is peppered with several beautiful musical compositions, and the climactic concert offers a truly breathtaking auditory experience. Speech is clear and full throughout. Outside of the score and musical performances, the mix is quite muted, but some sparse ambient effects do add a subtle sense of atmosphere to the proceedings. Gently falling snow is dispersed around the environment, and one scene features passing cars smoothly transitioning from the front speakers to the rear soundstage. Where the track really shines, however, is with its treatment of the film's musical compositions. The orchestrated pieces sound absolutely lovely, with crisp fidelity and clean separation. Dynamic range is also perfectly measured, allowing the violins, cello, and viola to really weep. The movie's finale is particularly arresting, and features a sumptuous explosion of harmonious texture, totally enveloping the listener in a wall of cascading melody. The chamber music doesn't exactly lend itself to booming bass, but low frequency activity is present when called for. While the effects work could have benefited from a little more immersion, there is no denying the classical music's incredible presence. The track as a whole isn't quite a show-stopper, but the movie's final scene is genuine demo material. Discord and Harmony: Creating A Late Quartet (HD, 8 min) - Presented in 1080p, this is a brief but fairly interesting assemblage of cast and crew interviews. The participants elaborate on the film's themes, family dynamics, and the story's metaphoric relationship to music. One of the cast members also shares a pretty amusing story about learning to fake his violin playing on-screen. 'A Late Quartet' might not hit all the right notes, but the resulting melody is still worthwhile. Despite a few narrative stumbles, Christopher Walken turns in a memorable performance, the film's central themes are potent, and its finale is beautifully realized. The video transfer is near reference quality and the audio mix is strong, reproducing all of the movie's chamber music with crisp fidelity. Unfortunately, there is only one very brief supplement included, but it does offer some decent insights. Despite the lack of special features, the disc has a strong technical presentation and the film is solid. This release is definitely worth a look.